No matter where we go, no matter what we do, we can’t escape the calorie counters. Nowhere is safe, not even Shea Stadium, the home of my beloved New York Mets and my favorite spot for sausage and peppers. Last night I attended the game against the Rockies, and thankfully they won – this is now 9 games they won in a row! I’m almost wishing they didn’t have the All-Star break right now being that they’re on such a hot streak. I could go into all of my feelings about the Mets right now, but then it wouldn’t be a food blog. If you’re going for a special occasion (like the Mets in the playoffs!) 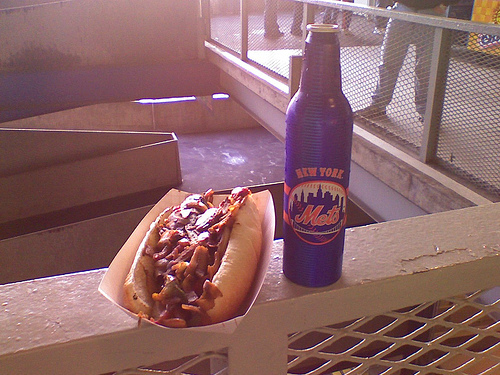 and speaking as a fellow Met-fan, I think we’ve earned our right to splurge. Though if you’re a season ticket holder, you may want to trade those chicken tenders for the grilled chicken sandwich. And in baseball, if there’s anything worth mastering, it’s smart trades. Mayor Bloomberg Says Let's Dance! Patsy's Pizza for 60 Cents!